Brakes? My caliper doesn't look stock, help. I am working on brakes this weekend and this is the first time i have had the Autobahns of the car to check everything out. (bought it a few months back). I have the Haynes tech manual for 79-85 (all models) and i was working in accordance with that. Long story short; front wheels off and book says to remove all these clips, funny, i don't see any clips on mine. and i don't see a 17mm screw on the pic in the book like i have. The book shows about 3 or 4 steps before the caliper can be removed. I take the my 17MM screw out, bleed a little and the caliper swings up and comes right off. suspect. 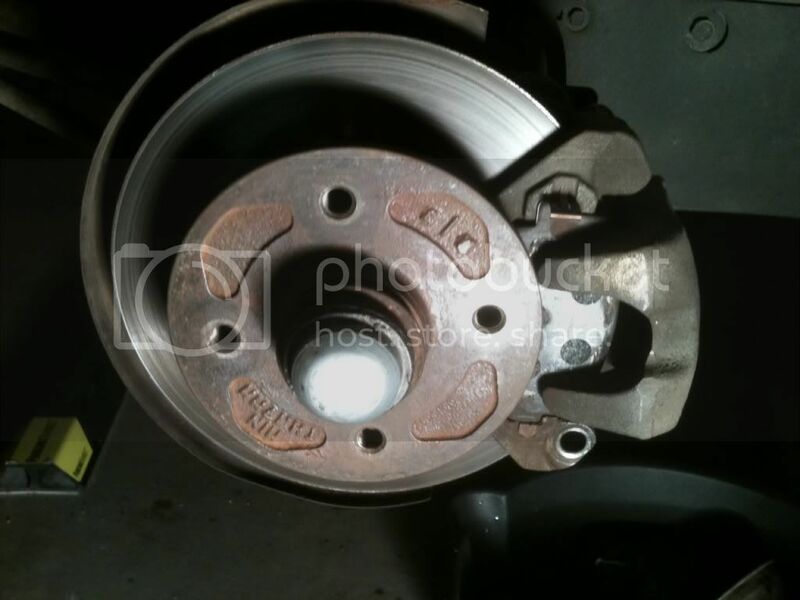 The brake pads that are on there now are Hawk Performance HP Plus PN#7266-2c-gg. I don't believe this is the stock caliper and i was hoping you guys could help me identify this setup? Looks stock to me. I always thought the FSM was better than Haynes anyways. I agree partially, the one piece hub and rotor are stock. 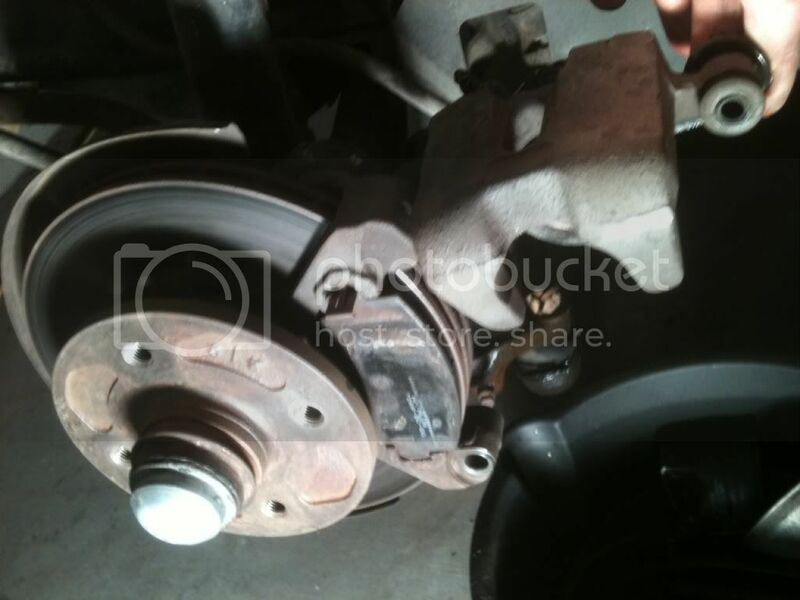 but that caliper is missing all the clips contained in block 7 on diagram and i have already found out that some parts on this car are from an old Porsche i.e. seats. i might try to look up what models that specific part number fits. The parts in block 7 deal with keeping the pads in place and making sure they don't stick to the rotor. You can purchase replacement hardware on mazdatrix. alot of that in block 7 gets done away with sometimes during it's lifetime. usually due to being lost or it gets worn down to nothing. You've got at least one of the clips. That metal spring on the top ear of the pad is one of them. I know I lost a couple when did the brakes a couple years ago. Can't say for sure on Mazda but most braking systems have some type of spring clips .. Like Bridgh said they help keep everything in line and they are also used for an anti rattle devise to keep the pads from vibrating and causing all kinds of weird noises .. In some applications if the springs are not used the pads can end up wearing uneven ( the pad will wear out one half and have some left on the other half of the pad ).. Use them if you can find if not I wouldn't worry to much..
ok, well thanks guys. maybe it is all stock just missing pieces. I'll wait for my new brake pads and see if that does away with some of the stop sign screeching. the Hawk performance site does say that these pads are noisy and are truly really just for the track, etc. i took them off to have a look at them and they are are actually in great condition. really thick and no marks so maybe some racer somewhere will have an interest in them. for me i am trying to make it more of a track / street car so i went with Semi-Metallic's. I'll know for sure how everything works out once the pads are delivered Tuesday. thanks again for the help. Quick Reply: Brakes? My caliper doesn't look stock, help.